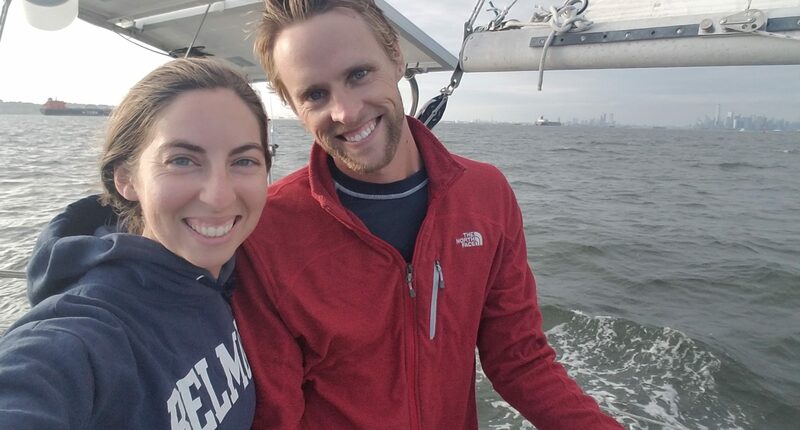 Lauren George, a 2015 music and religious studies alumna, recently set sail along the East Coast with a dream to move aboard her sailboat and travel for a few years alongside her husband Trey George, a fellow Belmont graduate. While at Belmont, Trey studied philosophy and worked as an editor during the early years of Belmont’s journal of philosophy, “Philologoi.” His position involved calling for and publishing student research across the globe. He points to his time on campus as having contributed to his ability to ask the “big questions of life” and formulate his own ideas towards meaningful fulfillment. “Upon graduation, all of the tests and quizzes and essays and journals couldn’t hold a candle to the biggest body of work that Belmont’s department of philosophy helped me complete,” Trey said. “New perspectives, broadened horizons and a radically different worldview. I saw opportunities in places I never would have previously imagined, and I felt equipped with the tools to take hold of them.” It was this mindset that ultimately landed he and Lauren in a unique environment soon after getting married in 2014. Interested in exploring an “unconventional lifestyle to continue learning and evolving continuously as they had at Belmont,” the newlyweds spent their first year researching their options after meeting another young couple who had made their boat a home. A year later they bought a 1975 sailboat and spent two years fixing it. By June 2018, they were ready to set sail and began their trip up the eastern coast of the U.S. as volunteers for the Ocean Research Project (ORP)’s Citizen Science Project, Fish Finder. One of six mariners selected to serve the initiative, the Georges work to record the locations of tagged animals in the sea and understand their migratory patterns. ORP works in partnership with the Smithsonian Environmental Research Center to tag animals so receivers can use acoustic telemetry to pick up their locations. Each time the duo was at anchor this summer, George lowered the receiver into the water and recorded the depth, latitude, longitude and time it was submerged. Though her experience might look different than the path she studied at Belmont as a music and religious studies major, Lauren is quick to mention her gratitude surrounding the opportunity to explore these vast, seemingly unrelated, topics. In the end they all point to her unending passion for learning new things. In late August, the Georges sailed out of the New York Harbor and passed Ellis Island. Unexpectedly chilly for the season, Lauren reached for her favorite sweatshirt — which happened to be from her time on campus.